This lively Fauvist canvas depicts the ScheldtRiver in the Belgian port city of Antwerp, where Braque and his colleague, the French painter Othon Friesz, spent the early part of the summer of 1906. Braque and Friesz produced more than a dozen paintings each of views of the ScheldtRiver from the balcony of the pension room they rented. Because these were among the earliest Fauvist works Braque painted, art historians consider this trip to Antwerp to be a decisive moment in his career. Guided by Friesz, who already had embraced the bright colors and expressive brushwork that defined Fauvist painting, Braque moved from Impressionism to a more expressive mode on this trip, applying non-representational color to deliberately flat, highly structured two-dimensional scenes. It was not until 1909 that Braque began working closely with Pablo Picasso and exploring the Cubist style for which he is best known. The Paris-based art dealer Henry Kahnweiler lent three works by Braque to the 1913 Armory Show: the Cubist composition Le Violon (1912, unlocated), the Fauvist landscape La Forêt (1908, unlocated), and Anvers. Kahnweiler offered Anvers for sale for $202.50, but it failed to sell. Nor did it attract the attention of the critics: Braque’s two other paintings were both mentioned in the press, but Anvers was not. In fact, the press’s coverage of Braque, and of his colleague Pablo Picasso, was surprisingly minimal considering the key roles they played in the development of Cubism. Their followers, the Cubist painters Francis Picabia and Marcel Duchamp, received far more critical attention, probably because they were better represented in the exhibition and because Picabia visited the Armory Show in New York. 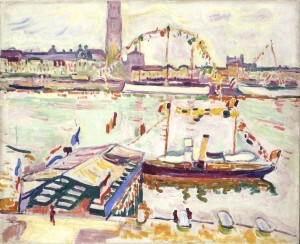 In his 1963 study of the Armory Show, Milton Brown wrote that the Antwerp painting by Braque that was included in the exhibition was The Port of Antwerp (1906, National Gallery of Canada, Ottawa). However, an examination of the installation photographs from the Armory Show’s Art Institute of Chicago venue indicates that it is actually the version in the Kunstmuseum, Basel, Switzerland, that was exhibited. Youngha Kim, “The Early Works of Georges Braque, Raoul Dufy and Othon Friesz: The Le Havre Group of Fauvist Painters” Ph.D. Diss., Ohio State University, 1980, 132. For additional views of Antwerp by Braque, see Georges Braque et le paysage: De l’Estaque à Varengeville, 1906-1963 exh. cat. (Marseille, France: Musée Cantini, 2006), 156-159. See W.D. MacColl, “The International Exhibition of Modern Art: An Impression,” Forum 50 (July 1913), 24; and “Art Extremists in Broadsides of Lurid Color, Invade New York and Capture an Armory,” New York Herald, February 17, 1913, 10. Milton Brown, The Story of the Armory Show, rev. ed. (New York: Abbeville Press, 1988), 250. One of the most influential artists of the twentieth-century, the French painter and sculptor Georges Braque was deeply involved in his groundbreaking experiments with Cubism at the time of the Armory Show. Braque initially trained as a house painter and decorator before taking up artistic painting about 1897. His work proceeded stylistically from Impressionism to Fauvism before he began exploring geometry and simultaneous perspective—the basic tenets of his Cubist work—in 1908. Working mostly in close collaboration with Pablo Picasso, Braque created Cubist paintings, collages, and papier collé compositions until the outbreak of World War I in 1914, when he enlisted in the French army. He sustained a severe head injury in 1915, and following a prolonged recovery, resumed painting in 1916. In his later works, he traded the harsh abstraction of Cubism for more personal works characterized by brighter color and textured surfaces. Braque continued to paint and sculpt until he died in 1963. For a complete biography, see Alex Danchev, Georges Braque: A Life (London: Hamish Hamilton, 2005).